“How often should I change my oil?” We don't know about your oil, but the oil in your vehicle should be changed on a regular schedule. Most manufacturers have recommendations printed in the owner manual. Recommendations vary by use, driving conditions, and oil type. 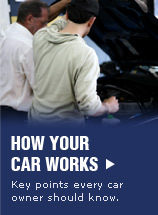 We can help you establish the correct interval for your driving style and vehicle needs. “Should I really rotate my tires? I was told not to with radial tires!” Absolutely not! Let us do it for you... Tire and vehicle manufacturers have recommendations for tire rotation schedules, but more importantly offer guidance on the correct rotation pattern. If you are not sure, always consult your vehicle owner manual or bring it by Auto Kruser's and let us take care of it for you. On newer vehicles, the replacement parts may not be available in what is called the “After Market”. When parts are available at the corner parts store they are said to be “After Market” parts and are often less expensive then buying the same part from the vehicle dealer; however, when parts are only available from the dealer, as is the case with some newer cars and most new models, they are said to be “Dealer Only” and are usually more expensive. Another factor that affects price is number of vehicles manufactured. As a general rule parts for a 2002 Ford Taurus are going to be less expensive than parts for a 2002 Lexus LS400. This phenomenon is largely due to the After Market as well. High manufacturing numbers lead to higher failure rates which in turn lends itself to the production of After Market parts and the higher availability of parts at auto salvage yards. Low manufacturing numbers have the opposite effect. “Do you sell tires and batteries?” Yup to both. And although we don’t have the specialized equipment necessary to mount and balance tires or align your vehicle, we do have an arrangement with a tire shop that is near by that takes care of it for our customers. If you feel that your vehicle needs to be aligned or your tires need to be replace or balanced, just let us know and we’ll take care of it for you. The same is true for auto glass. We strive to provide our customers with a one-stop experience. If you have auto glass that needs replacement, just let us know the next time you bring it by for service and we'll get it replaced for you. “Can I drop my car off after hours?” Whatever works for you works for us! We have ample parking both behind and in front of our shop. We also have a convenient key drop so you don’t have to make a special trip just to get us the keys.